Niché sur le front de mer de Cultus Lake, notre Lake House offre une escapade idyllique. Nous vous invitons à vous détendre et se vautrer dans la vue incroyable de la beauté sauvage des montagnes majestueuses, les grands sapins, et notre lac vierge. Profitez de tout cela à partir de notre retraite bien-nommé. The Lake House offre et mobilier exceptionnel de toutes les commodités modernes pour un confort bien nantis pour faire de votre séjour chez nous une véritable escapade. Right on the water. Doris met us and gave us the low down on the house. Very easy to work with her. We had an amazing family reunion! Excellent location facing the lake. House is well equipped. It is perfect for some family fun in the lake. Our family brought along 3 stand-up paddle boards and a small kayak. The dock is less than 1 minute away from the house! We happened to be around when Cultus Lake was having its annual Fun Day with many booths, parade and firework at night. What a nice surprise! The house was super clean and had everything we needed including lots of good quality kitchen ware. Our experience with the owners from time of booking until the day we left was perfect, they were so helpful. We stayed for 6 nights and enjoyed the lake, patio and cooking homecooked meals. 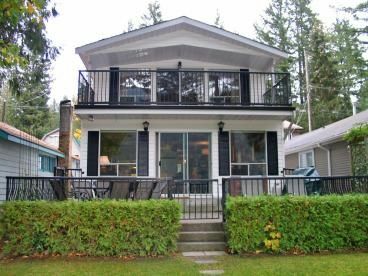 The location at Cultus Lake offers so much to do including swimming, seasonal waterpark, water craft rentals, all grass real greens putting course, great restaurants, ice cream shops, pizza amd the most amazing views!. We would highly recommend this home!! So glad you all had a good time. We enjoyed having you as guests. You are welcome back any time! This place is a gem. We had family get-together over 5 days and the place fit all 8 adults wonderfully. The kitchen was equipped with all the supplies to host big dinners and the patio area is nice place to eat and enjoy the view. The house is situated in a perfect spot - half way between the public use area and the campground, which make it pretty private. I would recommend this place to anyone! Thanks, Alissa. So glad you enjoyed your family get-together at our lake house. We were happy to have you! We rented the cottage for 5 days for our family of 5. The cottage was spacious and could easily accommodate 2 families of 4 each. Doris, the owner met us on arrival and showed us around and was extremely accommodating and eager to ensure that we had everything we needed for a comfortable stay. The view from the living room and master bedroom was spectacular and we enjoyed playing chess, cards and scrabble when the weather didn't cooperate. The new kitchen was well equipped and we enjoyed cooking some hearty family meals. I would highly recommend this cottage for a family or singles getaway.